CPA (Cost Per Action) is another method you could pay for. This is when you pay other affiliate marketers something like .50 or $1 for a lead. This is normally a name and email address. No one has to buy anything so this often has excellent results for the affiliate marketer who gets a lot of traffic to their site. But because it is a low payment for the marketer, they know the money is in the volume so unless they do have a lot of traffic, this method is not the best way to make money for them. This is also not a good method for an entrepreneur to use either if they do not have a good list and relationship with their email list. The only reason why business owners pay for leads is because they know that they can turn that lead into money down the road. You should be able to make $1 to $7 for every person on your email list. But this is also another advertising and marketing method that must be studied more so that you do not waste your time. Many people do not see money from their list for a while once they have them. The trick is to keep them on your list, get them to open your messages and learn to trust you. Once they do, they will eventually buy off of you. But you need to nurture that relationship. You cannot act like they are just there to make you money because if you don’t treat them right, you won’t have any money. You can also have a free avenue for building your list with a squeeze page and a free offer such as a book or piece of software that they receive when they sign up. This does save you money but is a slower process for the most part unless your blog/website/squeeze page receives a lot of traffic. If you don’t have a product to give away or sell, you can purchase what is known as PLR material. This can be books, videos, courses, or even software. What you do is go through it, make some changes, add some things if you want, and then put your name on it. It then becomes your own product to sell or give away. You can purchase PLR material many places online and one of my favourite places to find content is through Easy PLR. They are my personal favourite and I have never heard anything bad about them. The owner Nicole Dean is also a big time successful marketer who teaches at an event called NAMS twice a year where many of us go to learn more tricks for growing our business online. When you have an email list, you can send special offers to them that offer them extras for purchasing. For example, if you were trying to host an event and needed to sell tickets but needed to gain more exposure, you could offer a free report you had just written, a free coaching session, or something else you may feel like they would benefit from depending on your niche if they agreed to buy your tickets. 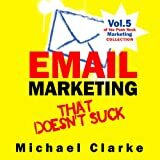 Need help with your email marketing? I have been using Aweber for the last few years successfully and there are so many useful tools you can use to build your business it is definitely worth the $20 a month. You can watch all the videos you need for help on getting things set up plus if you sell things online at places like Etsy, you can install a cool app that will allow you to import your customer list from there to your aweber account seamlessly and without pain so you can work on getting repeat sales and continuing to keep your customers happy. Sign up for a free 30 days now! Don’t leave money on the table. $10 to $20 a month for such a powerful tool that will help you build your income to multiple figures is not a lot to pay and entirely worth it!